Aarón Sánchez reveals the meat, salsa, and marinade that will upgrade your taco game. Tacos are the perfect summer food: Not only are they light enough to eat in hot weather and simple to assemble, but tacos are also the perfect vessel for fresh produce and grilled meat. As unfussy as tacos can be, however, there is a method for making them right—a handful of grated cheese and canned salsa will never do if you really want to impress. Aarón Sánchez, owner of Johnny Sánchez and judge on both MasterChef and Chopped, has spent much of his cooking career perfecting tacos. Here, he shares his best advice for achieving that wow-factor. At the moment, Sánchez is using beer—in particular, Miller Lite—as a seasoning in his cooking. “I think beer helps bring out the inherent flavor of whatever it is you’re cooking,” he says. Sánchez also has an easy method for storing his marinating meat, which makes it easy to toss the pieces on the grill when he's ready to start cooking. Try sticking to a heat level on your tacos that will give the ingredients a kick, without being too overwhelming. 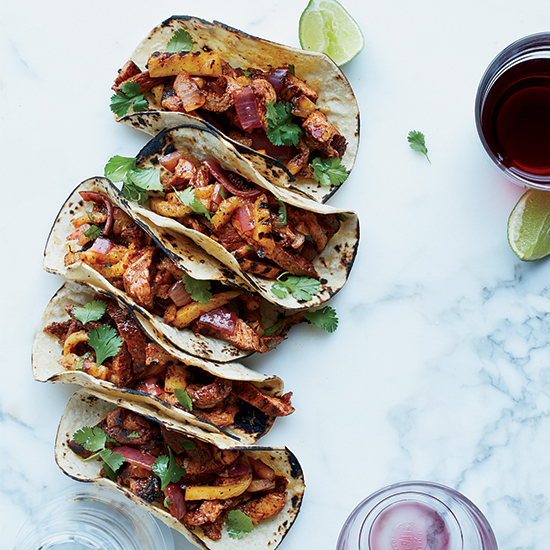 If you’re new to taco making, planning a big party, or just looking for an easy option that won’t take too much energy or effort, Sánchez recommends sticking with chicken. “Chicken thighs, I think, are a dynamite option, because they don’t dry out and they take marinades really well,” he says. What’s his favorite way to dress chicken before tossing it on the grill and then wrapping it up in a tortilla? The key to making a memorable salsa is to make sure it’s fresh and uncomplicated—though that doesn’t mean plain. “The key is to have a green and a red salsa. Have tomatillo-based sauce, with avocado, cilantro, and lime, and a tomato-based sauce,” he says. There should be more on the table to offer your guests as toppings besides just salsa, though. Sánchez also recommends putting out marinated onions, along with some lime juice and some chili, and chopped cilantro and other herbs. That way, your guests can add their own flourishes. Don’t worry: the rule for choosing tortillas is simple and easy to remember.